If you have a non-emergency medical issue, you may be able to resolve it with an app instead of making a visit to the doctor. CIO.com mobile apps reviewer James A. Martin tested two apps to get advice about an unexpected allergic reaction and received surprisingly helpful advice. A few weeks ago, I put on a pair of brand new latex gloves — something I hadn't worn in years — to do some heavy-duty cleaning. Within an hour, a latex allergy I never knew I had turned me scarlet from scalp to toe. My skin was on fire. I didn't think it was serious, but it was extremely uncomfortable. 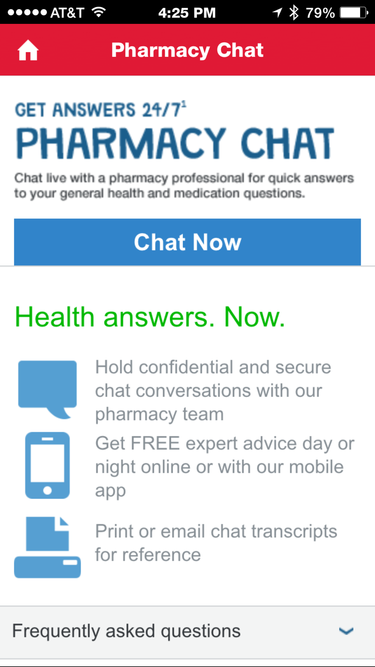 Coincidentally, I'd recently read about the free Walgreens pharmacist chat feature, which is available in its Android and iOS apps, as well as on its website. I used the Walgreens app on my iPhone to get advice. It only took a minute or so before a pharmacist came online to answer my questions. She suggested I use topical lotions with aloe to reduce the burning sensation. I also asked if I should take Benadryl, an over-the-counter antihistamine. The pharmacist said that would work, too, but it would also make me drowsy. I asked if she could check my prescriptions to ensure Benadryl doesn't conflict with anything. After a few minutes, she returned and said that based on my prescriptions, she did not recommend taking Benadryl orally, but a topical gel would be fine. The Walgreens chat was a satisfying experience, because the pharmacist had access to my prescription history and could give me informed advice. Unfortunately, this isn't the case with First Opinion, a freemium iOS app that puts a high-tech spin on the "doc in a box" concept. The app lets you text questions to one of First Opinion's six "family medicine practitioners," but it doesn't have access to your medical records or prescriptions. The doctors are available 24/7, and they're supposed to respond to queries within 24 hours. If you pay $9 to upgrade, your queries are supposed to be answered within five minutes, and you can send photos to help with a diagnosis. First Opinion requests only your first name and email address. You can also use a passcode lock to help ensure the privacy of your chats in the app. 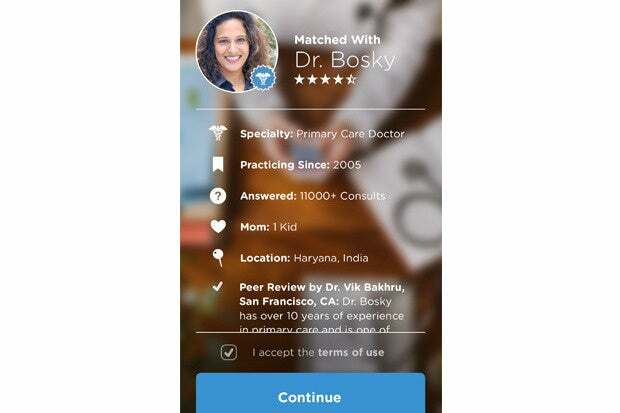 After signing up, I was paired with "Dr. Bosky," a "general practitioner and a mom," according to the app. Dr. Bosky responded almost instantly. I explained the latex reaction. Her suggestion: Use calamine lotion or aloe vera gel for the burning sensation and "run cool water or have cold showers to soothe the skin." I asked if she thought Benadryl would be helpful. She said it might help but that I should try "something locally first," meaning a topical lotion instead of a pill. Based on these two admittedly limited trials, I give a slight edge to Walgreens, assuming they have a record of your prescriptions and if your situation requires something stronger than over-the-counter medications. However, I still like First Opinion, and as its name suggests, it could certainly be useful for a first, or perhaps a second, opinion.